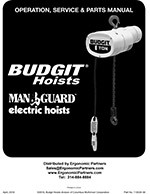 Our most economical and dependable electric chain hoist. 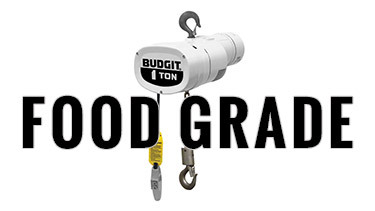 For economy and dependability, the Budgit chain hoist is a tough hoist to beat. There are units that have been out in the field for over 50 years and are still working in production environments. These hoists are built by CMCO (Columbus McKinnon Corporation). Since 1935, Budgit has led the industry in innovation, quality and dependability. 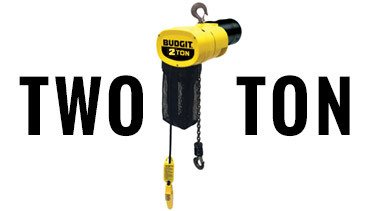 These compact, lightweight, economical chain hoists are built to withstand the rigors of heavy service and repeated lifting cycles. 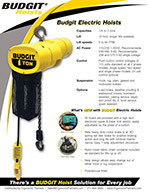 Budgit electric chain hoists have been designed and manufactured for tough jobs and are made in the U.S. 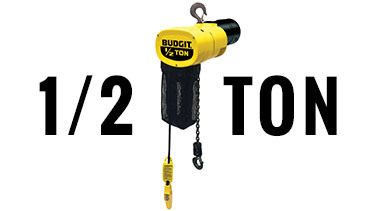 Most 1 ton chain hoists and 2 ton chain hoists are in stock and ready to ship same day. Call or email us and let our team help you with the proper hoist selection. Capacity Range: 1/4 thru 3-tons Metric Rated. Standard lifts are 10, 15, and 20 feet. Other lifts are available. Lifting Speed: 5 to 64 fpm, available in single speed, two speed or variable frequency control. Voltage: 115/230-1-60 hz single phase or 230/460-3-60 three phase. Brake: Heavy duty AC spring set motor brake with easy 1-step adjustment procedure. Gearing is totally enclosed in an oil-bath, allowing lubrication for long life and avoiding any environmental contamination. High-torque H4 rated heavy duty motor as defined in ANSI/ASME performance standards for electric chain hoists. Two speed models are rated H4 heavy duty for fast speed and H3 standard duty for slow speed. Overload protection prevents lifting excessive loads. Class F insulation with thermal actuated switches embedded in the motor winding for protection from overheating. 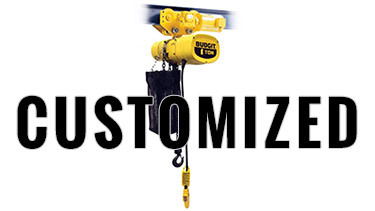 Hoist Control: Weatherproof NEMA-4X enclosed push-button control station specially contoured for operator comfort allowing easy one-handed sure grip control. Paddle type upper and lower control limit switches are easily adjustable. Powder coated lightweight aluminum frame provides long lasting durable finish and resistance to corrosive environments. Plated load chain and painted hooks are standard. 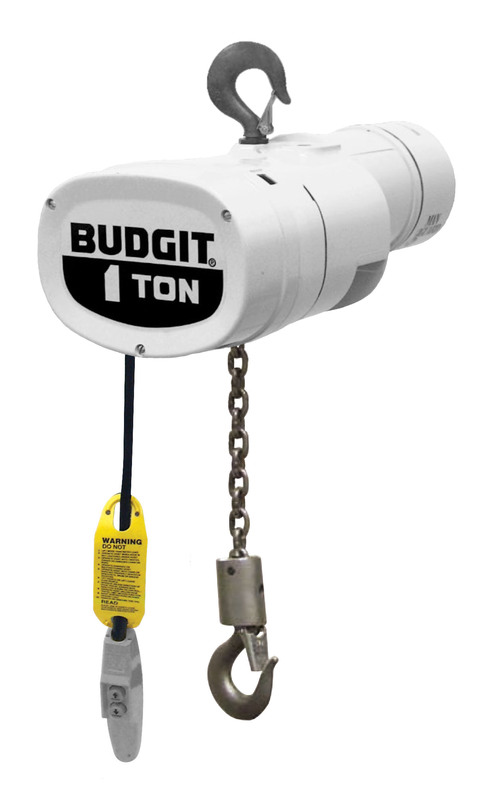 Budgit electric hoists and motor-driven trolleys are designed to meet ASME/ANSI B30.16 standards, NEC electrical codes, ISO 9001 certified and are CSA approved. 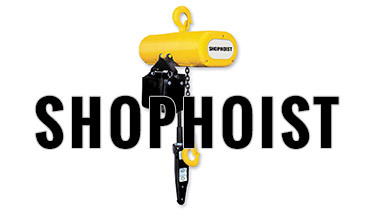 Each hoist is thoroughly inspected and tested to over 125% of rated load prior to shipment. 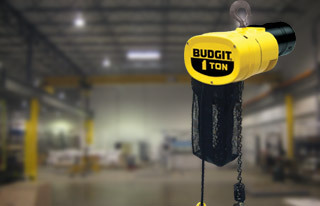 Contact Ergonomic Partners to help select the right Budgit hoist for your application. 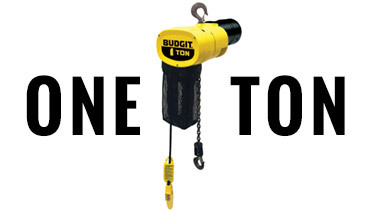 Ergonomic Partners is a platinum CMCO distributor for Budgit chain hoists; serving clients from coast to coast, Canada, Mexico and especially focused in the states of Missouri, Illinois, Indiana, Kansas, Arkansas, Mississippi, Nebraska, Tennessee, Kentucky, Iowa, and Oklahoma.